After having a wonderful dinner at Barmarché, I could not stop craving their amazing Crispy Bass Taquitos in soft-shelled flour tortillas with guacamole, pico de gallo & apple cider slaw. 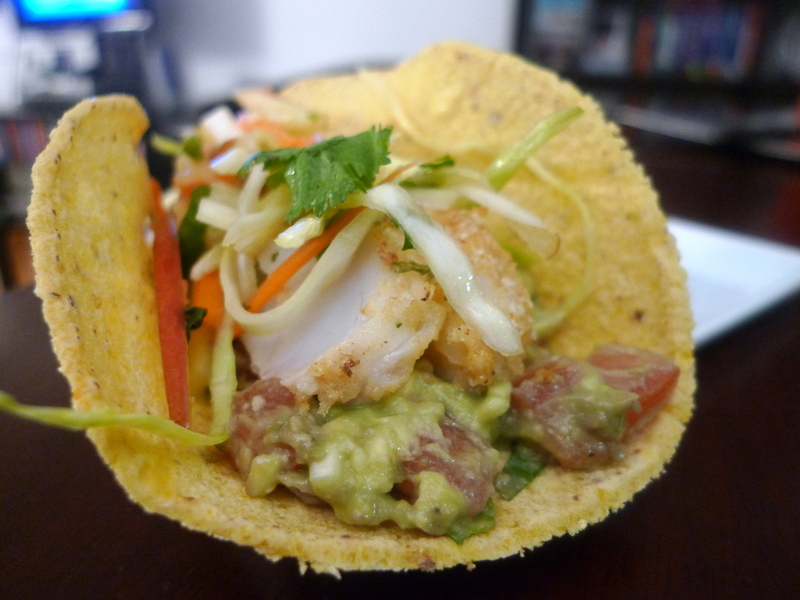 I have made Shrimp Tacos with Mango Salsa before and figured… why not try fish? So when I was doing my regular grocery shopping, I saw some cod fillets were on sale and decided I would attempt to replicate the Barmarché dish at home. As you may or may not know, my attempts at healthy eating requires me to find frying alternatives. So as tempted as I was to try the beer-battered fish tacos, I decided to go for a baked version instead. I decided to follow Bobby Flay’s advice marinate the fish first in a lime juice, jalapeño, chili powder, cilantro concoction. For half of the fillets, I tried just baking the marinated fish on its own and it was quite delicious and flavorful by itself! However, for the other half of the fillets, I decided to coat them with breadcrumbs THAT version was the winner for my fish tacos. I didn’t really need to use flour or egg as the breadcrumbs stayed on perfectly fine after the fish had been marinated decently. It was super yummy even without a crispy beer-batter coating! To complete the dish, I made some Guacamole, Pico de Gallo, and Apple Cider Slaw to top off my fish tacos. It was a lot of fun to make this, and pretty simple too! Preheat the oven to 425°F. Cover a large baking sheet with a piece of aluminum foil, and spray with cooking spray. Set aside. 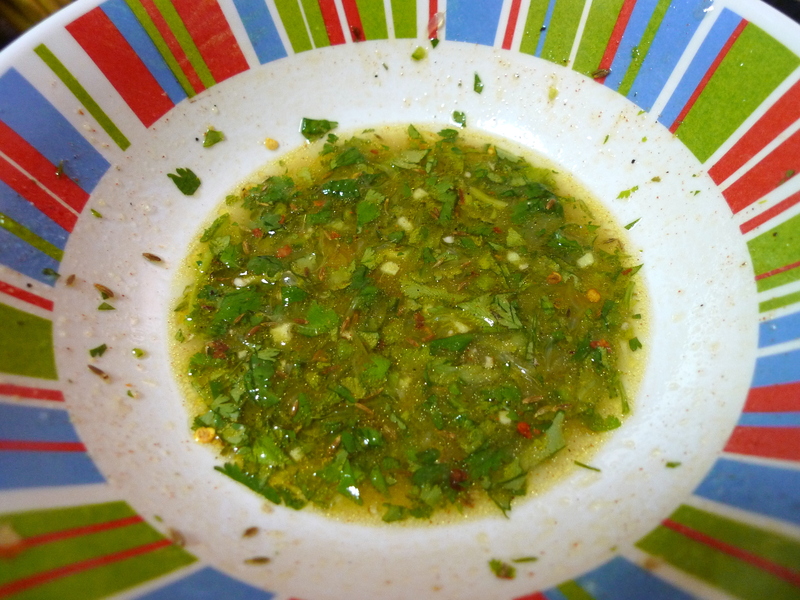 Whisk together the oil, lime juice, chili powder, jalapeño, and cilantro. 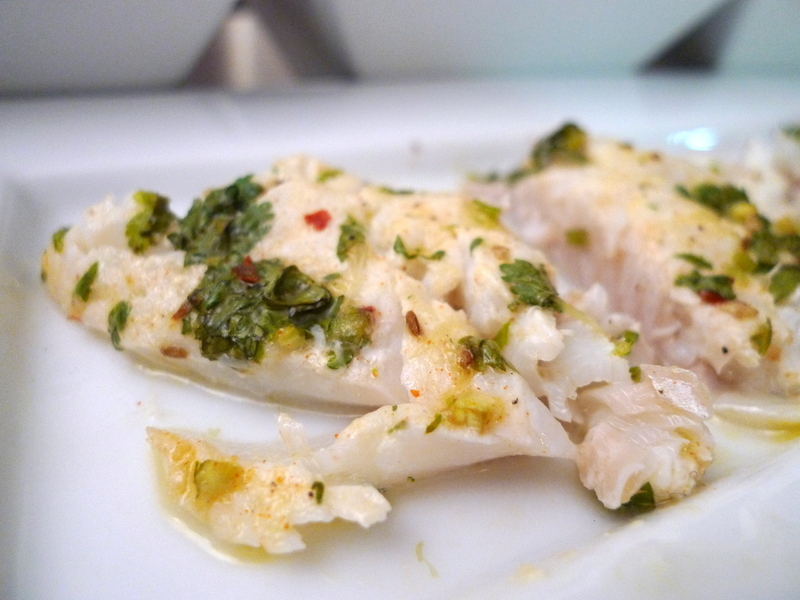 Pour mixture over the fish and let marinate for 15-20 minutes. Sprinkle some salt and black ground pepper. 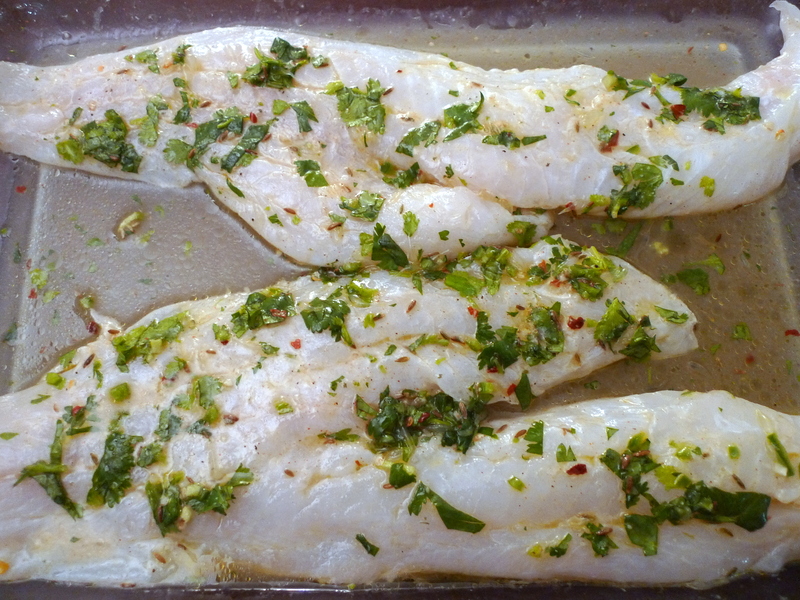 Option 2) Cut the marinated fish into individual servings. Pour some of the breadcrumbs into a small bowl. 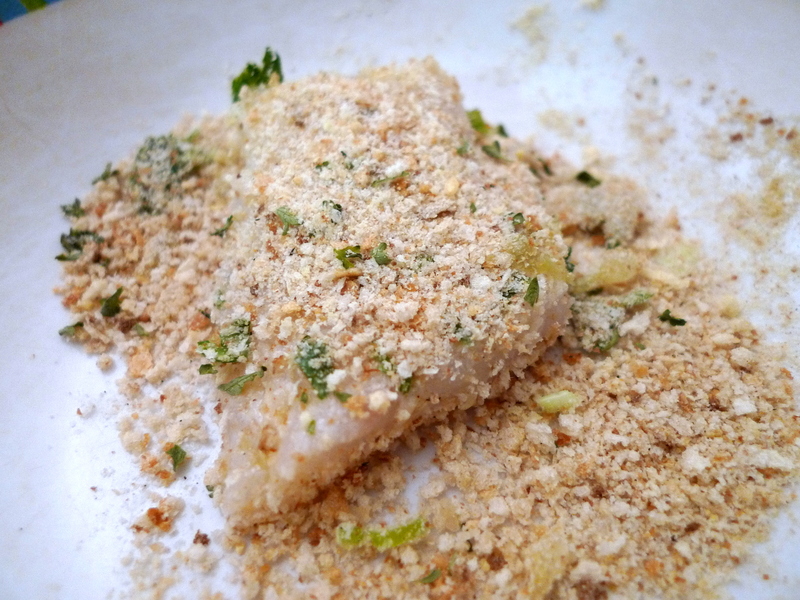 Place a piece of fish into the breadcrumbs and coat evenly. Repeat with each piece until all the fish has been breaded. 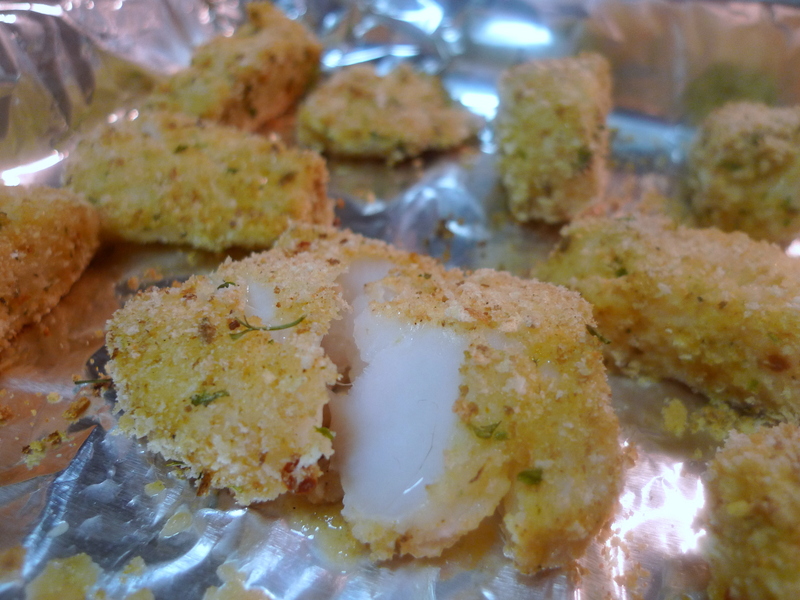 Bake for 15 minutes or until the fish flakes easily with a fork. While the fish is baking, prepare some yummy toppings for the tacos, such as Guacamole, Mango Pomegranate Guacamole, Mango Salsa, Pico de Gallo, or Apple Cider Slaw. I think some form of slaw is a perfect complement to fish tacos, and guacamole + sour cream is just a necessity. 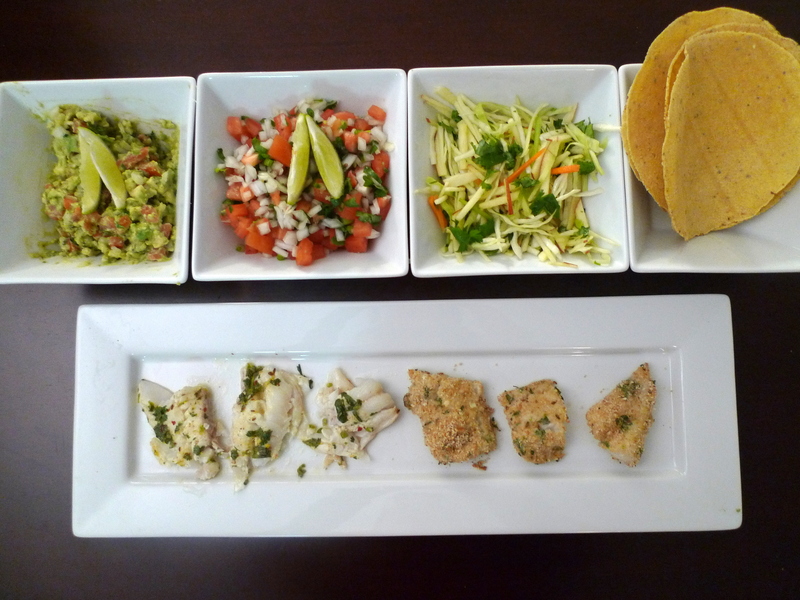 I went with Guacamole, Pico de Gallo, and Apple Cider Slaw for my Baked Fish Tacos. It tasted great plus felt super healthy! The recipe calls for 1 T chili powder. However, from your pictures, you either didn’t use it or you used red pepper flakes. I’m making this following the recipe right now and hope it’s not too spicy with the chili powder…. hopefully wasn’t too spicy! I did use both chili powder and red pepper flakes. I realized when I took photos, I actually had used red pepper flakes in place of the jalapeño chili. Either can work! But red pepper flakes are much easier to source…! You listed flour tortillas as an ingredient but in the pictures it looks like you used corn tortillas. Which one should I use? ah sorry good catch! i did use corn tortillas but meant to use flour as I prefer the softer texture with seafood… really a personal preference though! Great recipe. Used Newman’s Own Mango Salsa on top of all the rest of the goodies. Will be making this again. Thanks. I’ve been trying to make fish tacos for a while now. I followed your recipe and added in-season mangos and my wife said it was my first successful attempt! Thank you, these are delicious! This recipe is awesome! Paired with the cider slaw and margaritas this our new favorite dinner! thanks joe! glad you enjoyed it and happy cinco de mayo! Delicious! 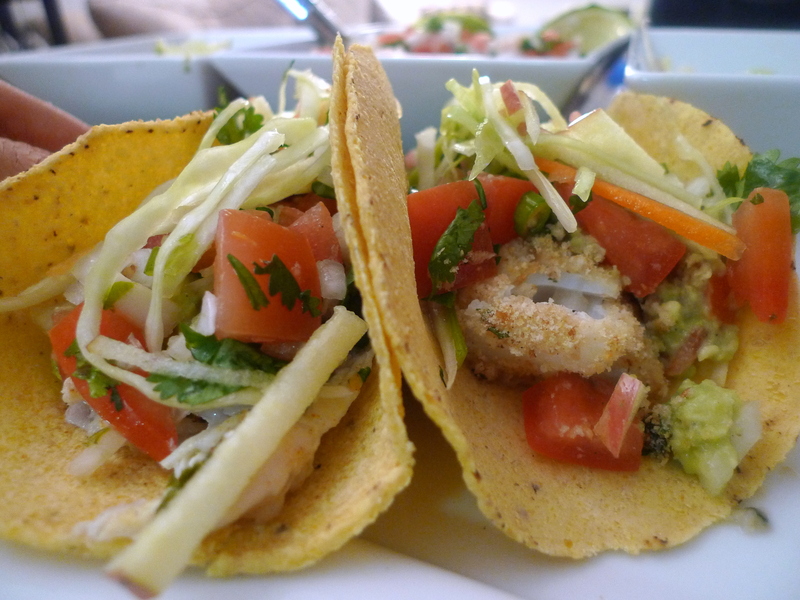 I stumbled upon this recipe online, and used it as inspiration for a fish taco dinner. Even my 3 and 1 year olds liked it! I served it with a chunky avocado salsa, your cider slaw (fab! I added red peppers and onions and a little lime, and omitted the celery and apple just bc I of what I had on hand) and chipotle mayo (so good with fish tacos – mayo mixed with chopped chipotles in adobo sauce, and lime juice). Thank you!